Let's look at the upper-right cell in this image. Wow, what a customer segment. Look at last year's purchase/visit activity. 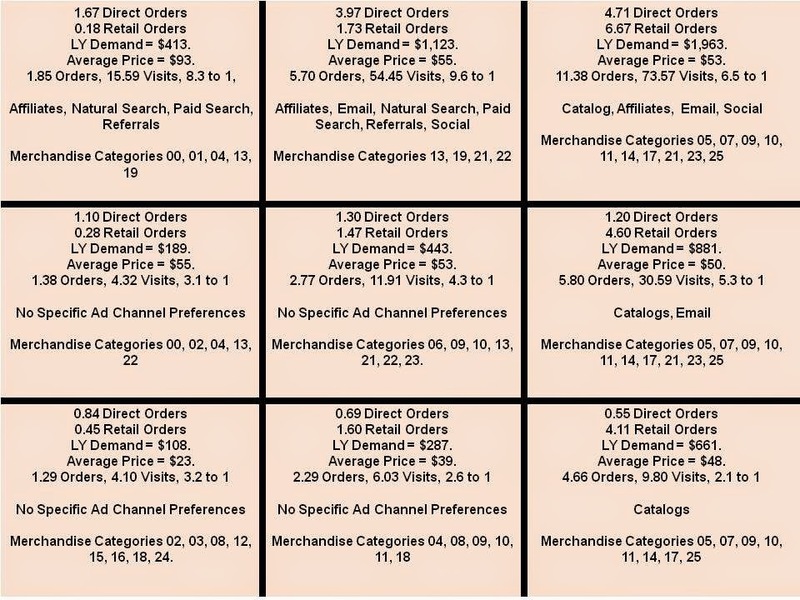 4.71 Direct Orders (Online) Last Year. 6.67 Retail Orders Last Year. 11.38 Total Orders Last Year. 73.57 Website Visits Last Year. 6.5 to 1 Visit-To-Purchase Ratio. This is the most valuable of the nine customer segments in my analysis - these customers spent $1,963 last year. This customer is truly "omnichannel", even as the pundits describe omnichannel behavior. Look at the characteristics ... the customer buys via catalogs, affiliates, email, and social media. My goodness! And the customer splits orders between online and stores, wow! This is what omnichannel customer behavior actually looks like. The customer essentially "does everything". In fact, if you look at "best customers", you will almost always observe that the customer "does everything", because that's what best customers do! But most important, this customer visits the website 6.5 times for every purchase. In other words, stop demanding that this customer buys RIGHT NOW. Stop! This customer visits the website once every six days. That's nuts!! Heck, this customer segment is responsible for 35% of the website visits in the past year from customers who purchased last year. We need to make a clear distinction among customers - "segmenting them", if you will. Some customers must be converted, now, or you won't see the customer ever again. And then we have loyal customers - why hawk these customers with promotional nonsense when the customer visits the website once every six days? Contact me for your own, customized Online / Retail Dynamics project (kevinh@minethatdata.com).